Spectrograms are a means of visualizing the energy and pitch of a particular sound. 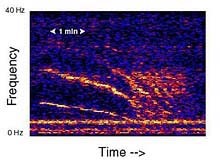 In this example of a blue whale call, the spectrogram (upper image) plots time (horizontal axis) versus frequency (vertical axis), with warm colors representing high acoustic intensity. The first part of the call is a pulsive sound, which varies little in frequency, and the second is a frequency-modulated moan, represented by the down-sweeping curve. 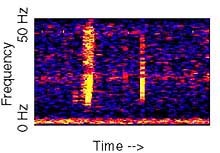 Often, the spectrogram is accompanied by a time series plot of the sound (lower image), where time is plotted on the horizontal axis, and amplitude or loudness is on the vertical axis. Click image for larger view. 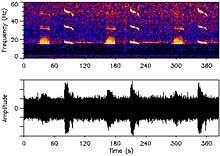 The sound of this earthquake (44k, requires QuickTime ), located near Astoria Canyon, was recorded by a U.S. Navy SOund SUrveillance System (SOSUS) hydrophone. Typically, an earthquake produces a triangular-shaped signal on a spectrogram, with the highest acoustic energy (yellows and reds) occurring in the 5 to 30 Hz frequency range. Click here for more information on earthquakes. Since May 1998, both SOSUS and the Eastern Equatorial Pacific autonomous hydrophone array have detected extremely loud volcanic tremor-like signals (1.1Mb, requires QuickTime ) from the Volcano Island chain south of Japan. The signals are characterized by a high- amplitude fundamental at around 10 Hz, and three harmonics at 20, 30, and 40 Hz. The tremor signals typically appear as discrete packets that last for 4-5 minutes, with brief periods of quiescence for roughly 30 seconds, followed by the beginning of the next signal packet. Click here for more information on volcanic tremors. 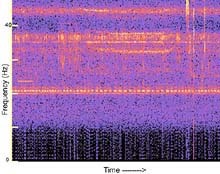 Spectrogram of acoustic signature of the NOAA Ship Ronald H. Brown. Click image for a larger view and to hear sound file. (848k, Requires QuickTime . This spectrogram shows the acoustic signature of the large oceanographic NOAA Ship Ronald H. Brown (848k, requires QuickTime ) as it approaches one of the hydrophone sites in the equatorial Pacific Ocean. The long, continuous, yellow-colored lines, or bands of noise, are created by the rotation of the propeller blades. The military routinely uses the characteristics of these blade lines to identify ship characteristics, class, and often individual vessels. Click here for more information on the acoustic signature of the Ronald H. Brown. 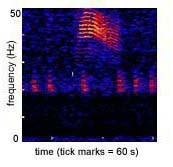 A spectrogram with lines or bands of sound is indicative of the turning of a ship's propeller (816k, requires QuickTime ). The frequency of these bands and other characteristics of the sound can be used to infer the style of ship. This spectrogram probably represent a relatively small vessel moving at high speed. Click here for more information on the sound of a small ship's propeller. Used to explore the geologic structure below the ocean floor, seismic airguns (816k, requires QuickTime ) produce "explosions" of air at regular intervals. This explosive release of air can create source amplitudes up to 240dB. The PMEL autonomous hydrophone array deployed in the central Atlantic Ocean recorded at least three different airgun sources from around the Atlantic Basin, sometimes simultaneously. The most frequent origin locations were near Nova Scotia, Canada, Northeast Brazil, and Northwest Africa. Airgun signals dominate approximately 75% of the annual data recordings. Click here for more information on the sounds of seismic airguns. The call of a northeast Pacific blue whale (380k, requires QuickTime ) is perhaps the best known to date. It generally consists of two parts, A and B. The A call is a series of pulses (on the order of 1.5 pulses/sec), while the B call is a long moan. Click here for more information on the call of the northeast Pacific blue-whale. Humpback whales (785k, requires QuickTime ) produce a very wide variety of sounds while on their feeding grounds in the waters of Alaska. Moans, grunts, pulse trains and long, complex songs have been recorded in these waters. These sounds were recorded in the winter of 1999 and include both upsweeping and downsweeping moans. Click here for more information on the sound humpback whales produce. The 20-Hz signals of finback whales (785k, requires QuickTime ) are perhaps one of the better described whale calls in the Atlantic Ocean. Typically, these signals are short (< 1s) pulses that downsweep from about 23 Hz to 18 Hz. These pulses typically are produced in groups, or "bouts." Pulse duration, frequency and bout length can vary with location. Click here for more information on the signals of finback whales. Minke whales (785k, requires QuickTime ) produce a variety of sounds described as thump trains, ratchets, clicks and grunts. 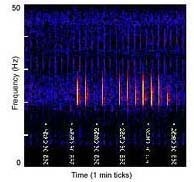 Spectrograms that resemble minke whale vocalizations have been recorded on the Atlantic hydrophone array. Click here for more information on minke whale sounds. This "Slow Down" sound (788k, requires QuickTime ) was recorded May 19, 1997 on the Equatorial Pacific Ocean autonomous hydrophone array. The sound slowly descends in frequency over about 7 minutes and was of sufficient amplitude to be heard on three sensors at 95W, and 8S, 0, and 8N, at a range of nearly 2,000 km. This type of signal has not been heard before or since. It yields a general location near 15S; 115W (far off the west coast of northern South America). The origin of the sound is unknown. Click here for more information on the unidentified sound, "Slow Down." This "Bloop" sound (452k, requires QuickTime ) was repeatedly recorded during the summer of 1997 on the Equatorial Pacific Ocean autonomous hydrophone array. The sound rises rapidly in frequency over about one minute and was of sufficient amplitude to be heard on multiple sensors, at a range of over 5,000 km. It yields a general location near 50oS; 100oW (far off the west coast of southern South America). The origin of the sound is unknown. Click here for more information on the unidentified sound, "Bloop."